Part of a diamond's beauty is its deep sparkle; but dirt, oil, and debris can cloud that sparkle and make even a stunning ring seem far less valuable. It is important, however, to clean them properly to prevent inadvertent damage that could void warranties or result in lost stones. Shallow dish just deep enough to cover the jewelry. Soft bristle brush such as a mild toothbrush. Mild detergent or recommended jewelry cleaning solution. Rubber gloves for sensitive skin. Lint-free cloth similar to one used for cleaning a camera lens or glasses. Source of running water or fresh dish of clean water for rinsing. Determine whether or not the jewelry can be cleaned at home. If you are unsure of the type of metal, accent stones, or security of the setting, it is best to leave cleaning to a professional. Furthermore, antique and heirloom rings are more delicate and may need professional attention. Set up a cleaning space. A towel helps protect surfaces from cleaning chemicals and be sure to choose a location with adequate lighting to see crevices as well as a location protected from loss (away from sink drains, etc.). Remove hairs or other fibers stuck in the prongs or setting. Tweezers can help reach tight areas. Presoak or rinse the jewelry to remove loose dirt. If rinsing under running water, grip the jewelry firmly or use a sieve deep enough to contain it without risk of loss. Dip ring in cleaning solution (diluted ammonia with three parts water, a similar solution with mild clean-rinsing detergent, or professional cleaner). Soak if desired. Gently scrub diamond with soft-bristle brush. Change angles frequently to work into crevices, but keep a firm grip on the jewelry. Rinse jewelry carefully. Use running water or a fresh water dish and change angles to remove all cleaning solution. Dry ring with clean lint-free cloth. Use the cloth to polish your ring for maximum sparkle and shine. How Often Should Diamonds be Cleaned? Overcleaning diamonds could result in inadvertent scratches either to the stone or to the surrounding metal. A gentle huff of breath and a quick polish with a lint-free cloth is sufficient for most daily cleanings, and diamond jewelry should always be removed when it may be exposed to excessive dirt, such as during yard chores or sporting activities. The best cleaning schedule is to care for diamond jewelry whenever its shine and sparkle begins to dull, whether that is weekly or only a few times per year. In addition, always clean diamonds before photography or prominent social occasions so they look their best. Even the mildest soap inevitably leaves chemicals and residue on surfaces it cleans. Because the refraction of light within the diamond is critical to its inner fire and beauty, even small deposits of soapy residue will dull the stone. Specialized jewelry cleaners and detergents formulated to remove deposits and chemical buildup are the best choices for cleaning diamond engagement rings and other diamond jewelry. Heavily soiled and dull rings may need stronger cleaning measures. Longer presoaking or more diligent scrubbing will help remove caked on grime, and repeating the entire cleaning process can be effective for most hard-to-clean rings. Home steam and ultrasonic cleaners are available, but should be used cautiously and only when the piece is truly filthy. 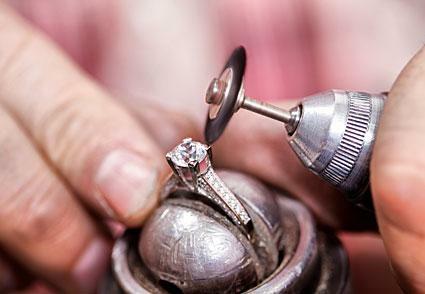 If after repeated attempts the ring is still not clean, it is best to take it to a jeweler. Most jewelers provide complimentary cleanings in just seconds, but returning to the jewelry store is not always convenient for regular cleanings. In certain circumstances, however, it is best to let a jeweler who knows how to clean diamonds care for the jewelry. Antique or delicate rings, for example, benefit from a professional touch. Any diamond jewelry that uses other gems should be professionally cleaned to prevent inadvertently damaging softer stones with measures meant for diamonds. Pearls, in particular, are extremely soft and should not generally be cleaned at home. Treated diamonds should also be professionally cared for, because certain chemicals and cleaning methods may cause damage or discoloration. When taking a ring or other diamond jewelry to a professional for cleaning, be sure they know what treatments the stones may have received, if there have been any modifications to the piece, and where potential problems may lie. Jewelers will often perform a cursory inspection prior to cleaning to determine any obvious care issues, but providing them additional information will help keep the jewelry at its best. Use pins, needles, or other sharp objects to clean crevices. This will scratch the stone or surrounding metal. Use bleach or other harsh, abrasive chemicals. Many such chemicals will erode or discolor metal. Remove the diamond from the jewelry for cleaning. Any modification to the jewelry should be attempted only by a qualified professional. A clean diamond is a gorgeous diamond, and knowing how to clean your diamonds properly will keep them sparkling brilliantly for years.